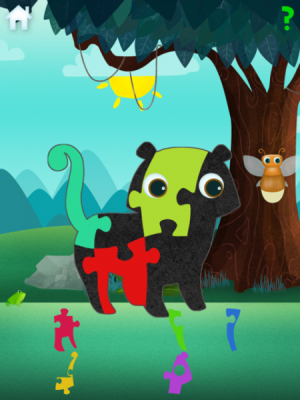 Pizo Animals is a puzzle app that includes many options adults can choose to customize the experience. Recently I came across some puzzles that are now too young for my six year old son - jigsaws that fit into wooden-backed frames instead of being boxed like the larger puzzles he now enjoys. Much to my chagrin, I realized that many of these puzzles were missing a piece or two, making them unacceptable for charity donations. I still remember the frustration of trying to keep all of these puzzle pieces together that even when completed did not sit well enough in their frames to keep these puzzles intact. Because of this, during his time at preschool we began to work on a lot of puzzles for the iPad and iPhone where the loss of pieces was no longer a concern, allowing them to be enjoyed while laying in bed or on the go. Even better was that, typically, different levels of difficulty were included within these puzzle apps that would grow with my son. Because of this I am always happy to test new puzzle applications, and I am eager to let parents know of a new puzzle app, Pizo Animals. 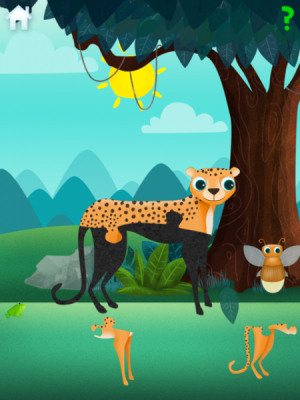 It's a bright and colorful universal app that allows children to work on animal puzzles with the drag and drop of a finger. Options may be set at four or eight pieces as well as the choice to include outlines showing where each puzzle piece needs to be filled in - be it pieces complete with animal textures and landmarks that may help complete these puzzles or the choice to include simple colorful puzzle pieces instead, asking children to focus on the fitting of these jigsaw shapes to complete the scene. The relative simplicity of these puzzles - be it with four or eight pieces - makes this app a nice choice for toddlers and those in preschool. Although my six year old now enjoys larger puzzles, he does spend time with Pizo Animals set on Difficult. Here, these animals are presented without a template of any sort, with just their eyes seen on the screen. Children complete these animals by choosing pieces that include eye holes and then working their way around from there. 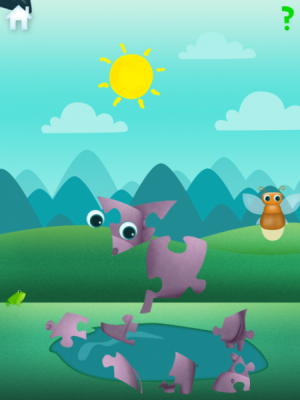 Likewise with the Easy and Medium settings one can ask for help in which the firefly will demonstrate the correct position of a puzzle piece - help children will appreciate when feeling stuck. Pizo Animals includes a lot of polish. The palette of colors is lush and includes a nice degree of texture that one can see within the landscape with rolling distant hills and ombre-colored grass and sky, complete with gently moving clouds and a sun that includes faint watercolor-like shading and a thoughtful sense of motion all its own. A few interactive moments are included as well. The sun can be tapped in order to shine brightly for a moment, complete with chiming musical sounds. Likewise, clouds can be tapped to create gentle rain as well as a rainbow - a nice touch. A firefly can also be seen, and a tap will include many interesting spoken facts about each animal, which I appreciate. It would be nice, however, if the volume levels for these facts did not diminish during the rainy sounds as this information can sound muffled and hard to hear. I do enjoy that when an animal is completed, its associated word is then spelled on the screen as a nice introduction to letter recognition and spelling as well as including another narrated fun fact. Another thing I like seeing within Pizo Animals is for the small ad for one of their other apps hidden within a Parents section of this app - a minor note, really, within a very nice puzzle app that children and their parents will enjoy.